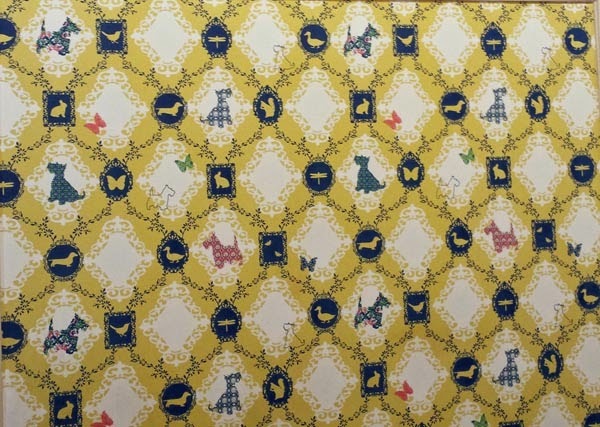 Scottie Dog wallpaper by Anthropologie on display at The Grateful Hound. Walter the Wabbit, aka Mr. Bunny, all wrapped up and waiting to meet Mr. K.
Heather got herself a bully stick! 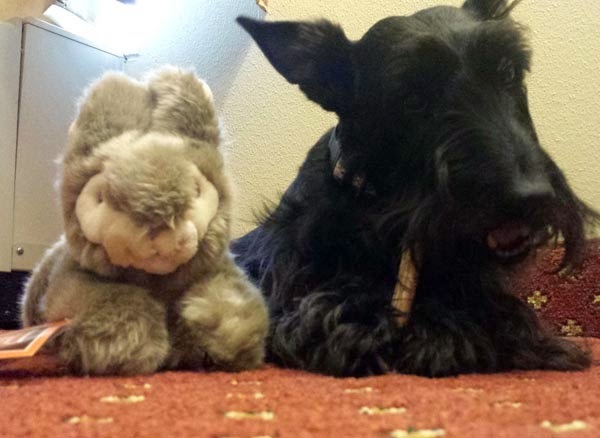 Mr. K hanging out with Mr. Bunny while he chews on a bully stick of his own. Friends, there is one place in Savannah we visited that we haven't yet told you about and for good reason. It is a little shop called, "The Grateful Hound." 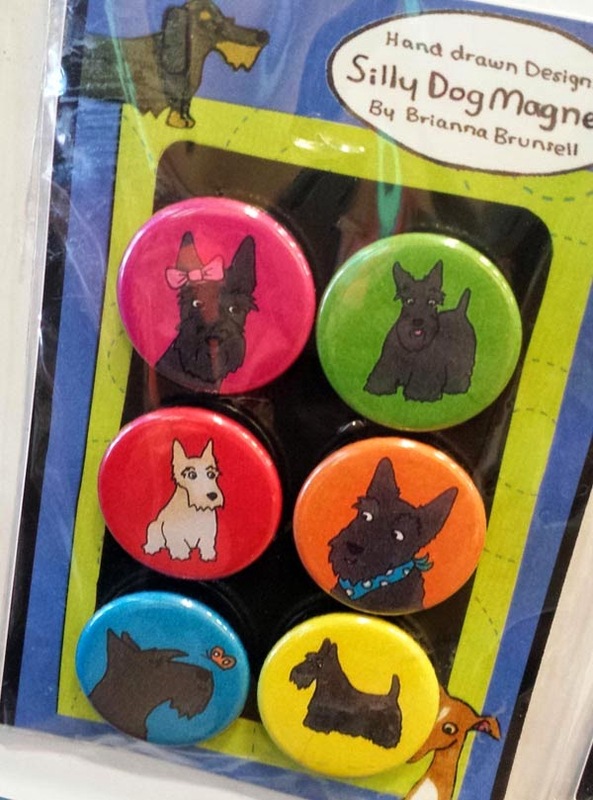 Not only did the place have Scottie dog wallpaper by Anthropologie behind the register, they also had a Scottie dog door stopper, Scottie dog magnets and...toys seemingly tough enough for Scottie dog jaws! I was skeptical at first but I decided to splurge and pay $20 to take a chance on a Fluff & Tuff toy after talking to the nice lady behind the desk about how her dog had yet to destroy his. 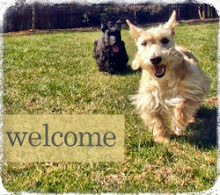 So, I picked out "Walter the Wabbit" (now nicknamed Mr. Bunny) and brought him back to Mr. K - the ultimate toy destroyer. Could this be the answer to Scottie Moms' prayers (and wallet woes)? At nearly $20 for Mr. Bunny, it was a hard price to swallow initially. Then, I considered the fact I could buy three or four Air KONG squeaky tennis balls (Mr. K's true favorite toy) for the same price and I realized I was lucky to get a half hour to an hour's worth of quality (and supervised!) playtime with each before it ended up "deaded." You might remember how quickly Mr. K went through all those squeaky tennis balls we stuffed in a stocking for him this Christmas. Surely, it would be cheaper to pay more up front for a toy like Mr. Bunny and have it last longer than a day. I figure if I can get a few months out of Mr. Bunny, he will be worth his price! We'll keep you posted on Mr. Bunny's status. 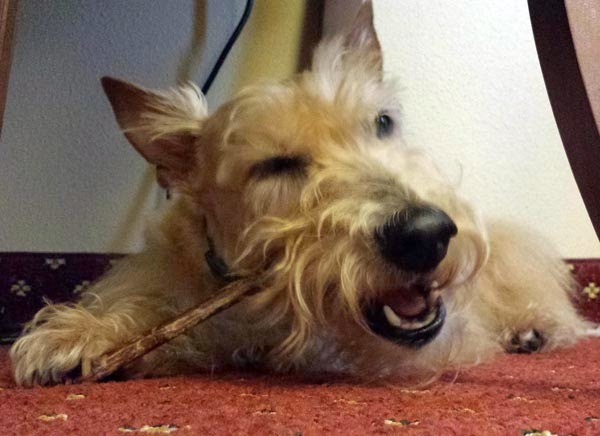 In the meantime, tell us: what toy has lasted longest with your pup? For Tassel, there is one toy that was her absolute favorite and it's still quite alive 10 years after buying it... It's a squeaky rubber hamburger! We like to play fetch with it in the living room, and if she can't find it in her toy box she barks until someone comes and helps her get it out. We lost it under a couch for about a year, but "the burger" is still one of her go-tos. Something we found that makes it easier to keep toys for longer is to always have a bunch in a box. If she wants to play, she goes and picks one out and brings it over. Sometimes she just empties the box and THEN selects her toy of choice. We think she secretly likes to make the mess almost as much as playing. Okay, I made the huge mistake of clicking the link to hear Mr. K's past fave squeaky toy while Lucy was at my side. I'm laughing, she's jumping up to see the toy, and not quite believing there is no toy on the desk. Hahaha. We need a Mr. Bunny is Lucy's toy box too! I'm tired of picking up body parts of stuffed animals. :-) Since we're not planning a trip north on 95 any time soon, I suppose I can find my own Mr. Bunny online at The Grateful Hound. Thanks for the lead, and as always, the chuckles. My Monte has a wee pink rubber piggie that was his gift on his 1st birthday. He’s two and a half now, and wee piggie is still intact. He won’t allow any other dogs to destroy piggie. We need continuous updates. I've been known to tear a PetSmart frisbee down the middle in well under an hour. 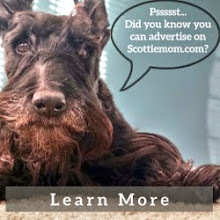 I hear you Scottie Mom...Wallace is the ultimate toy destroyer! Thus far the only toy he has not managed to kill and which he loves to play with is "Pinky" - a JW crackle head ball-thing. He is also quite fond of the de-stuffed stuffies, he's had one for over a year already. 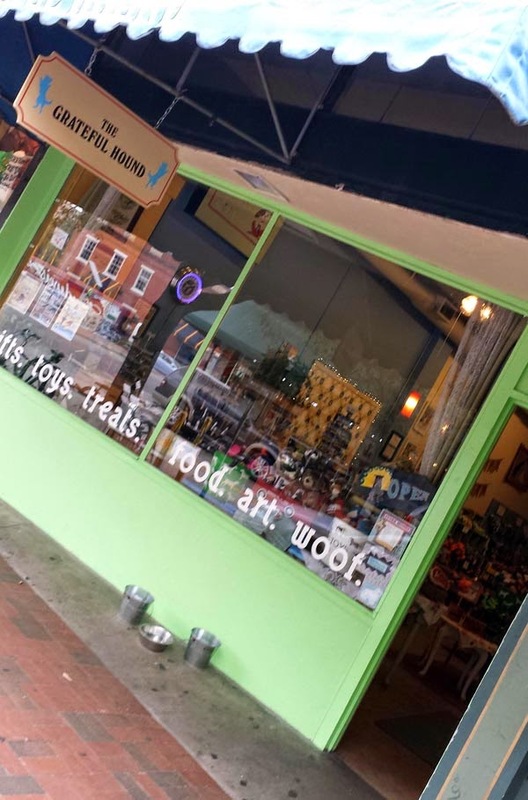 The Grateful Hound looks like an amazing shop! WOW....Scottie magnets, we need those so we could through away all the STUPID frogs magnets on stuff, WE ARE NOT FROGS. Now Bites has his stuffie bear that Stella Rose gave him fro Christmas, he loves it, he don't chew it he just carries it around the house and sleep with it, as for ME I don't do stuffies! 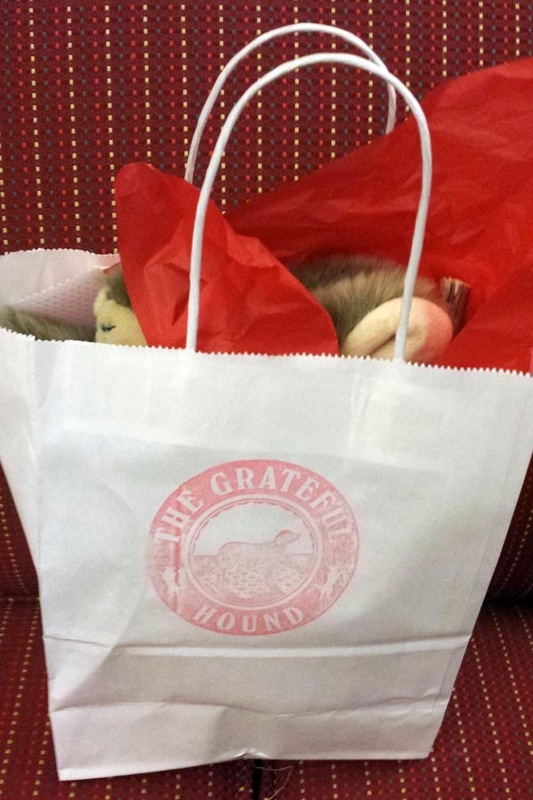 I am sooo diggin the Grateful Hound it's my kind of store. Now you've gone and done it! The flashy jaws of death will now shred Mr. bunny just cuz you praised it! SHE will be investigating this wonderful toy...we love wabbit toys....we play tug of war with the ears. Most either pull out or splt down the middle. Bonnie And Kenzie....kill the wabbbbbits! Those magnets are PAWSOME!! There is a wheatie! My peep NEEDS them! Funny that a better quality toy although more expensive lasts longer and therefore is better value in the long run. Seems Mr Bunny is a hit. Have a fabulous Friday. Please let us know how well this toy holds up. My MacGregor “killed” a toy made from the same material as a fire hose in 2 days. I am willing to pay a little more if it lasts. MacGregor says hello to Mr.K and Heather.